This is the top-teir 47 inch model of LG's greatly expanded line of LED televions boasting the Google TV platform. LG's Smart TV platform is also included on the set, making it quite the powerful contender when it comes to the Smart TV battlefield. The TV also has the TruPicture XD Engine for processing smooth images with rich color and deep contrast. LG even added a dual core processor to power everything for a truly smooth user experience. The LG 47GA7900 is equipped with the ultra thin 5mm (.2") panel depth and Cinema Screen design that shows very little bezel. This makes for a window like effect and the most unobtrusive frame we've ever seen. We certainly like it. This stylish design supposedly gives the viewer a more involved experience, and while we doubt that, we appreciate the minimalist and modern look. The stand on this series also got a bit of a change. Two arms come out from the bottom to hold the TV up. On the TV and Movies screen you can see how Google TV searches for and displays content to the user. Google TV also pulls from various sources. 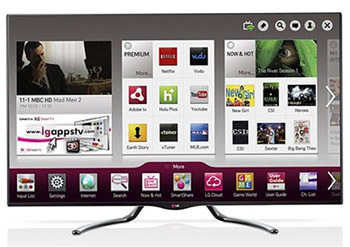 Smart TVs in general made a lot of progress in 2012, and we thought LG's attempt was a pretty good one. Add the power of Google TV to the 47GA7900 and the possibilities are endless. The updated Home Dashboard includes apps like HBO GO, Youtube, and many other choices to get you the best content right away. LG also included a very cool feature that will make the day of any gamer. OnLive, a streaming gaming service, is installed out of the box granting access to a large library of games. The days of the dedicated gaming console just might be numbered. It's a great app and it's nice to see LG incorporating it into their TVs. Included with the GA7900 is the new version of LG's innovative Magic QWERTY Remote. This remote operates using motion control and we really enjoyed it during hands on tests of the previous version.The point and click operation is fast and easy and we've found it to be the fastest browsing mechanism out there aside from a true QWERTY remote keyboard. This makes navigation and surfing the internet or looking through downloaded apps a breeze. This third version of the Magic remote includes updates such as a QWERTY keyboard and voice recognition. These additions will further the user experience of the remote by making searches by simply saying what you are looking for. While previous examples of voice recognition remote controlling (Samsung 2012) were slow and cumbersome to use, LG is obviously hoping to improve on the feature this year. The features assist in making it simple to change to specific channels, look for a certain genre of movie, or find a specific show available on the Google TV platform.